Scrapbooking is not just for photos. Creating a recipe scrapbook is a wonderful way to collect and preserve family recipes. A recipe scrapbook also makes a unique and personal gift. 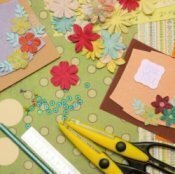 This is a guide about scrapbooking recipes. When I clip recipes from catalogs, I slip them inside a scrapbook page, instead of re-writing them on a traditional recipe card. It protects the recipes and because there's so much space, I can often include a photo of the dish, if it's provided. You could also create a gift for someone by scrapbooking a special cookbook this way (a great gift for a bride of her new husband's favorite dishes, and the scrapbook could be decorated in the wedding colors).